Get a FREE bottle of Bayer Advanced Aspirin! Getting your free bottle is quick and easy. Simply register to receive your FREE bottle. They are giving away 10,000 FREE bottles a day for 10 days. SHARE your experience after you've tried it, and Bayer will donate $1 (up to a total of $100,000) to the American Red Cross for every rating shared. 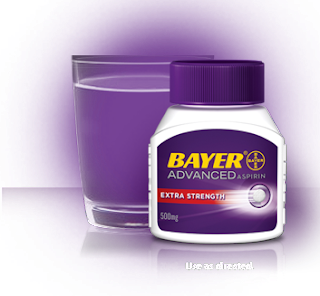 Today, they will start giving away 10,000 FREE bottles of Bayer® Advanced Aspirin sometime between 9:00 PM and 11:00 PM EST (6:00 PM and 8:00 PM PST). It's not everyday they give away something useful. The mechanics seem simple enough so count me in!